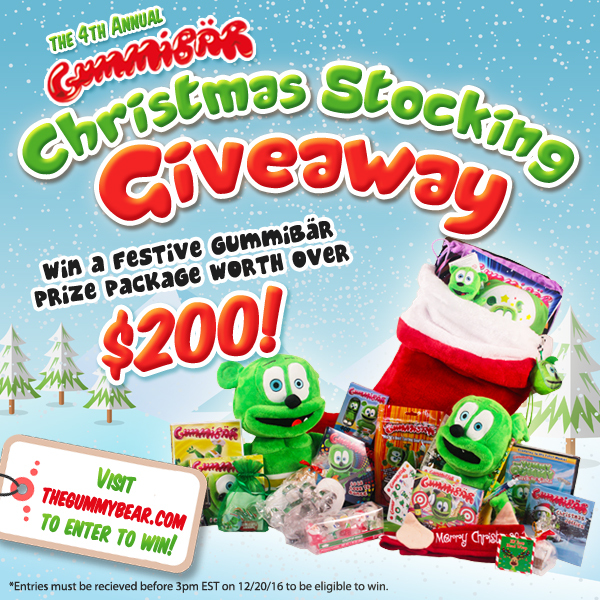 Gummybear International Announces Fourth Annual Gummibär Christmas Stocking Giveaway - Gummybear International Inc. The Fourth Annual Gummibär Christmas Stocking Giveaway has been announced. One lucky random winner will win a prize worth over $200 of Gummibär merchandise and Christmas goodies. The giveaway began today, Tuesday December 6th, 2016 and will run until Tuesday, December 20th 2016. 2. Post a comment on the official giveaway announcement page that answers the question: “What is on your holiday list this year?” Fans must be sure they leave a comment using the same email address that they are subscribed to the newsletter with. The Fourth Annual Gummibär Christmas Stocking Giveaway ends at 3:00 pm Eastern Time on Tuesday, December 20th 2016. One lucky random winner will be chosen within 24 hours of the end of the giveaway and notified via email. The prize package will be shipped out to the winner within 2 business days of receiving their shipping address. This year I want new pots and pans. My son wants a drone for Christmas and my daughter wants a lot of books! This article is the press release for the giveaway. We just want to be sure your entry is counted!